"Prik" means chile pepper and "khing" means ginger in Thai, so this is spicy ginger curry paste. This is an all-time favorite. Stir fry one can of prik khing curry paste with 1/2 cup cooking oil for 4 minutes (low heat). Add 3/4 lb chicken or pork, then slowly pour in 1/2 cup water and stir fry until its cooked. Add 3/4 lb long green beans. Cook and add 1 tbsp palm sugar. Sprinkle with kaffir lime leaves, fresh Thai chile and roasted peanut. Serve with jasmine rice. Ingredients: dried red chilies, garlic, shallot, lemongrass, sugar, salt, kaffir lime, galangal, spices (corriander seed, curmin, cardamom, bay leaves). Maesri Brand is recognized in Thailand as a high quality export product with rich taste and authentic flavor. The convenient and inexpensive 4 oz can is enough for 6 large servings, and we ship this in case quantity to many restaurants who depend on Maesri to make their restaurant Thai meals. 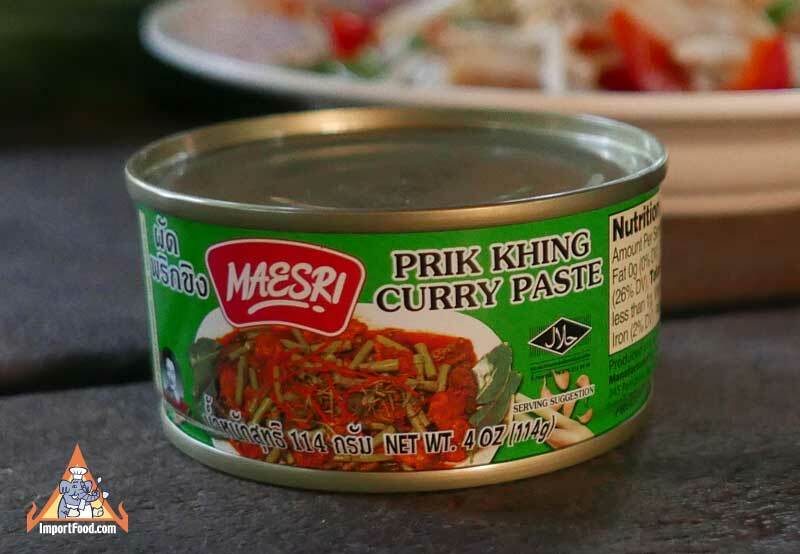 Chances are good that your local Thai restaurant uses Maesri as the base for their prik khing. We also offer Mae Anong brand Prik Khing Curry Paste.